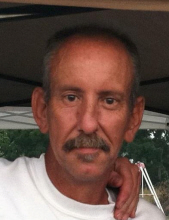 David Wayne Moad, 50, of Bridgewater, passed away Friday, February 8, 2019, at his home. David was born in Giles County, VA, on April 19, 1968, a son of Wanda Moad and special friend, Charles Shiflet, of Bridgewater, and the late Robert Monroe Moad. He attended Bridgewater Baptist Church and had worked as an electrician. David is survived by a daughter, Brandi Sutherland and husband, Andrew, of Ft. Defiance; sister, Sandra Bragg and husband, Wayne, of Shawsville, VA; grandchildren, McKinley and Lakyn Sutherland; nieces, April Blankenship, and Brittany Barker; many special friends. A memorial service will be conducted at 2 PM on Tuesday, February 12, 2019, at Bridgewater Baptist Church, with Rev. Roger Austin officiating. Burial will be private. Memorial contributions may be made to the American Kidney Foundation, 6110 Executive Blvd., Suite 1010, Rockville, MD 20852 and/or a Charity of Choice. Johnson Funeral Service in Bridgewater is entrusted with arrangements. Online condolences may be shared with the family at www.johnsonfs.com. To send flowers or a remembrance gift to the family of David Wayne Moad, please visit our Tribute Store. Rev. Roger Austin officiating. Burial will be private. "Email Address" would like to share the life celebration of David Wayne Moad. Click on the "link" to go to share a favorite memory or leave a condolence message for the family.